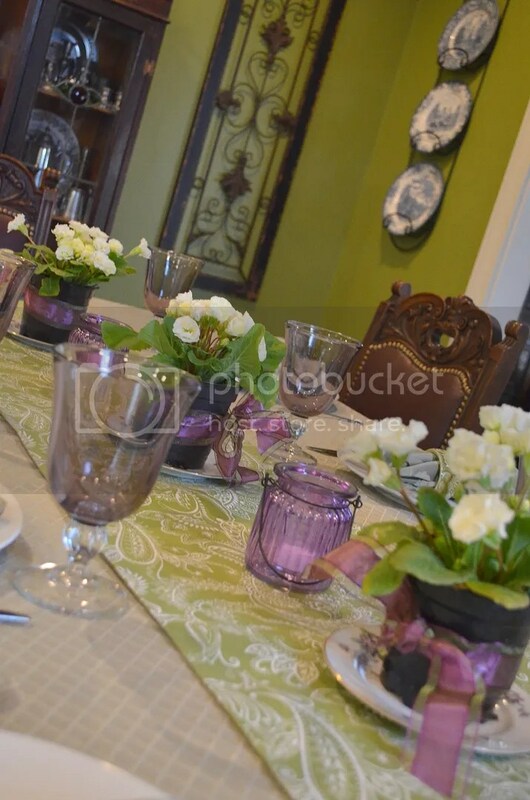 Tablescapes | The Happy Wonderer ~ ellen b.
Jamie and Dan both had birthdays this week so we planned a dinner party. 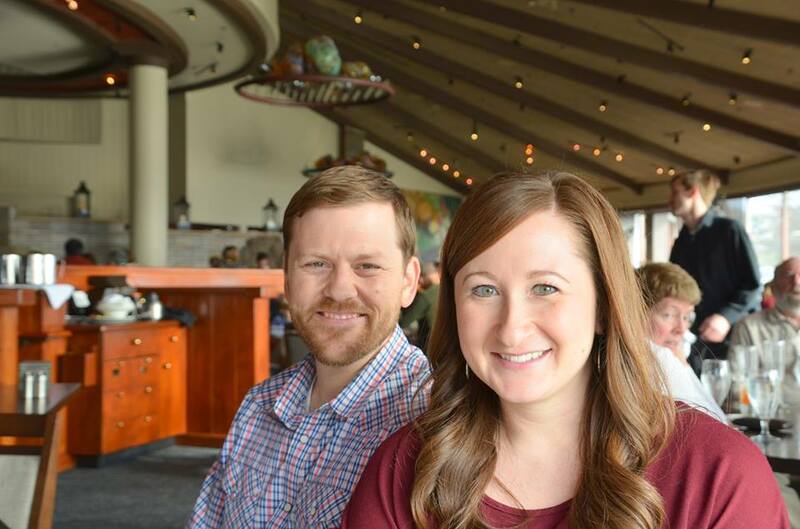 Happiest of birthdays to you Dan and Jamie. 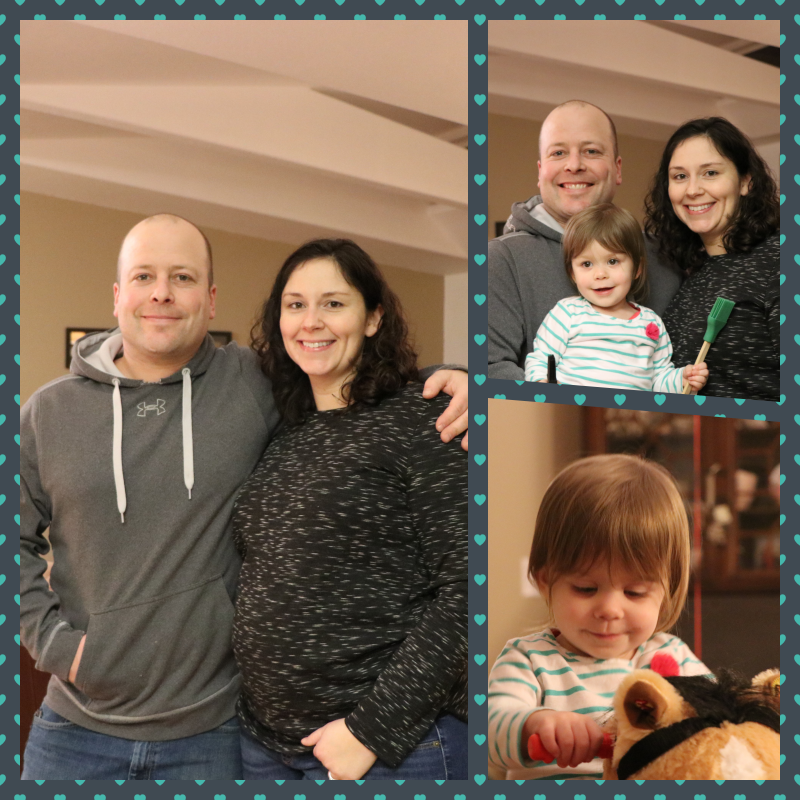 It’s going to be another landmark year in your lives as parents! 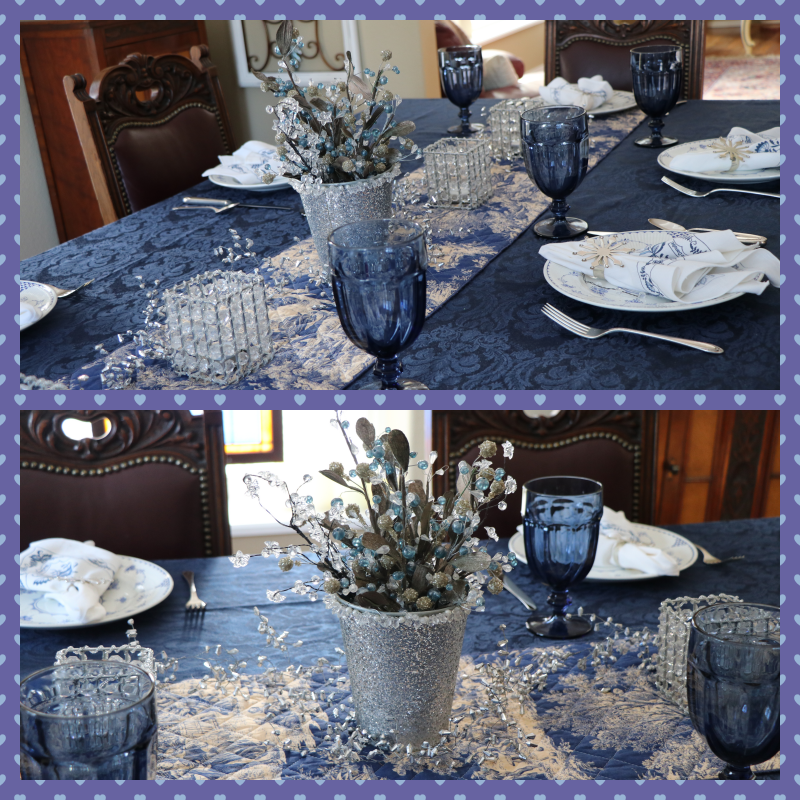 Jamie loves cobalt blue so I set the table with blues and since it’s winter I added snowflakes and sparkles. 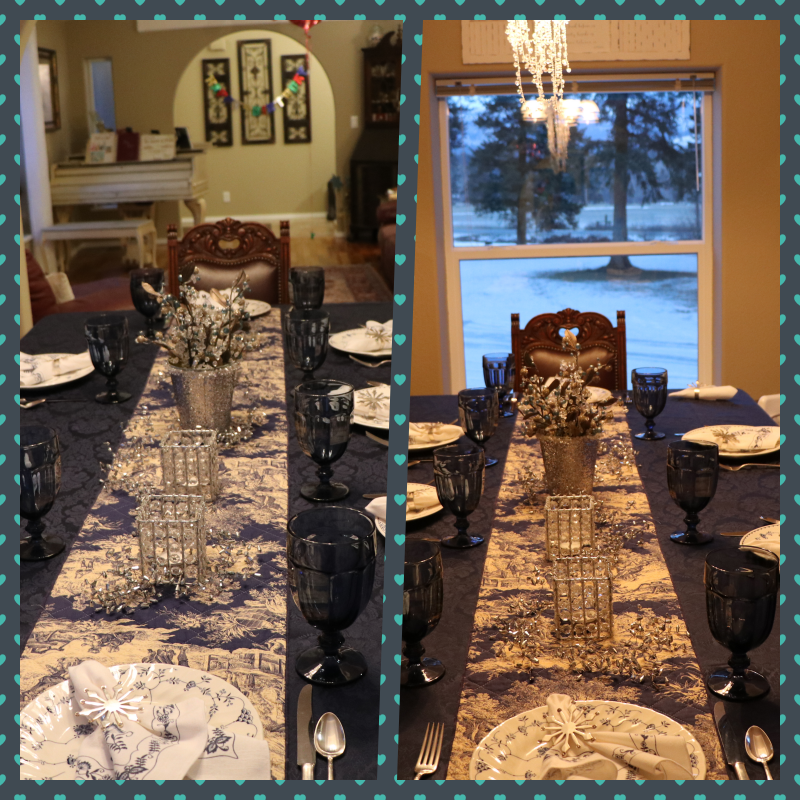 Photos taken with different light in the morning and evening. The birthday boy, birthday girl and Addy along with Jamie’s aunt, uncle and mother. 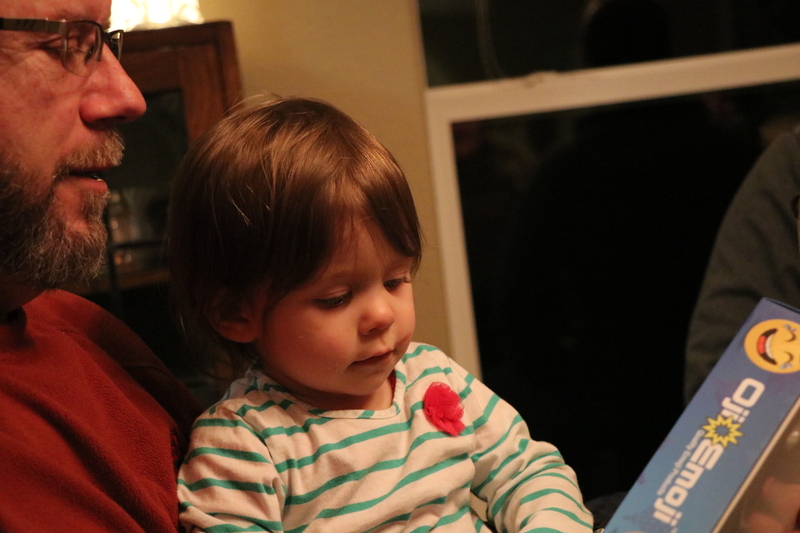 Addy loves and is loved by all these guests. 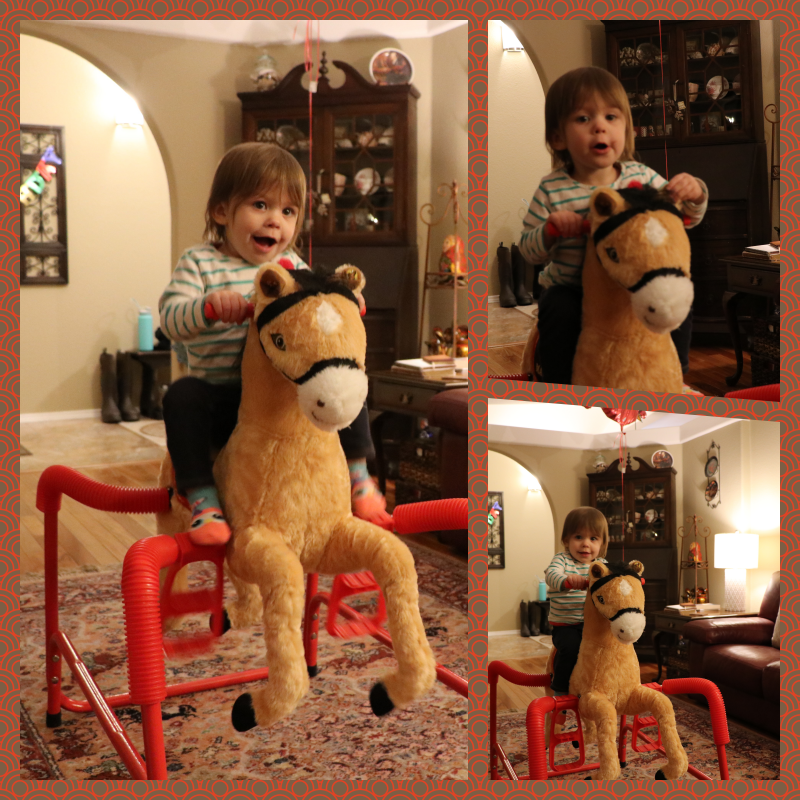 Addy is getting to be a pro at getting on and off Maverick! Our firstborn son’s birthday is tomorrow. It’s a landmark one. Where did all those years go. Happiest of birthdays to you, Josh! Glad we could spend time with you last weekend and that we’ll all be together again the last weekend in January! Happy last Friday of February to all of you! 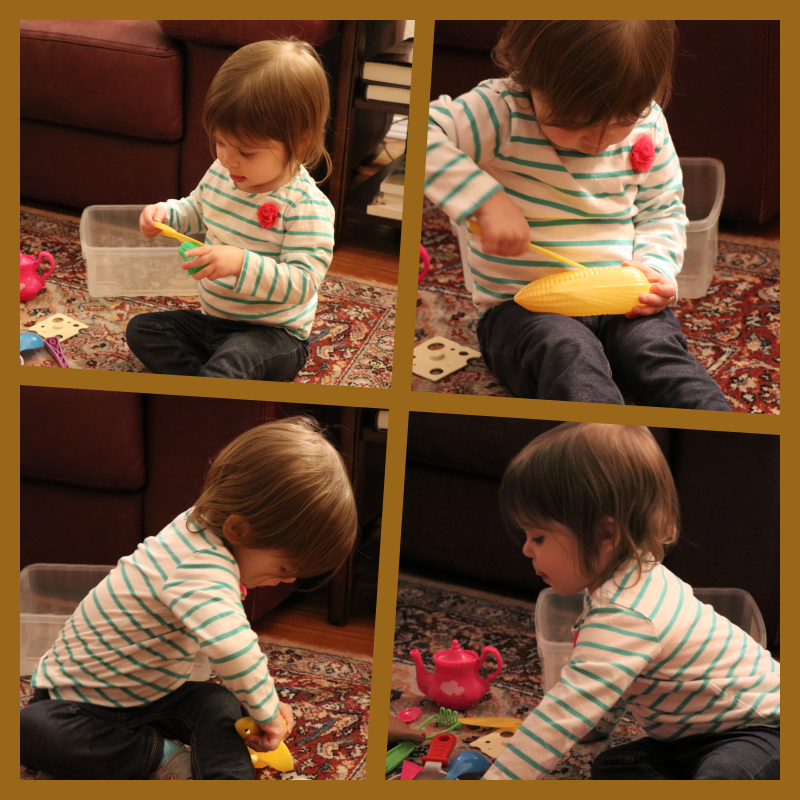 I’m sharing 5 flashbacks today from February past. These are memories that I like to remember. I will start with February of 2012. My sister Vera is a Leap Year baby so she only gets an official birthday every 4 years. 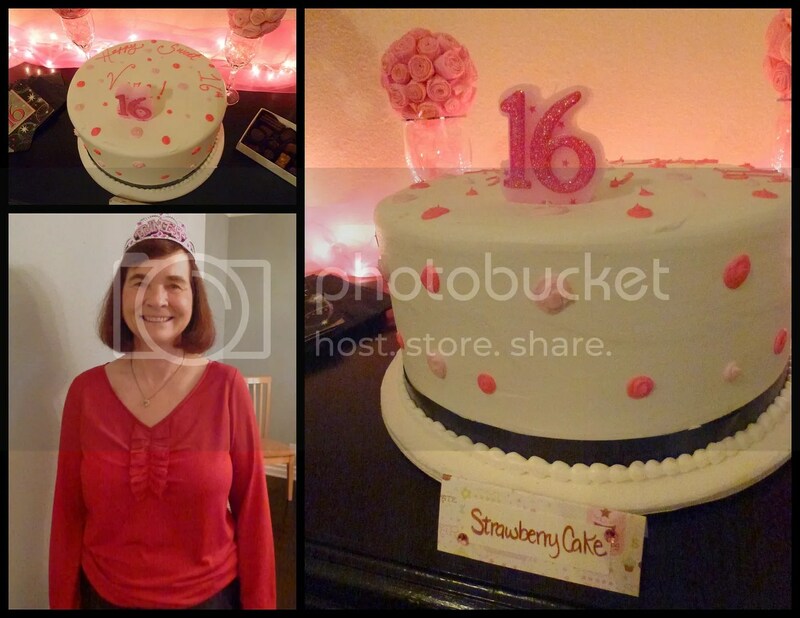 In 2012 her kids threw her a Sweet Sixteen Party since it was her 16th actual birthday. 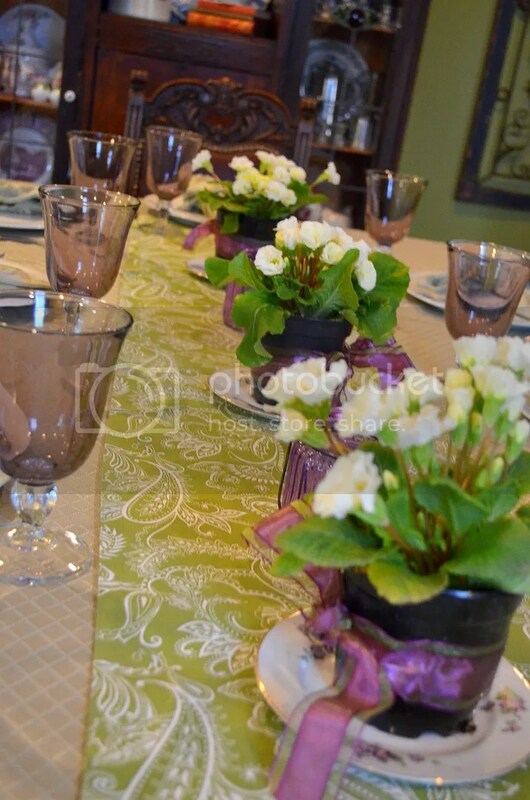 It was such a fun party! Since this Monday is another actual birthday for her I wanted to share this flashback. 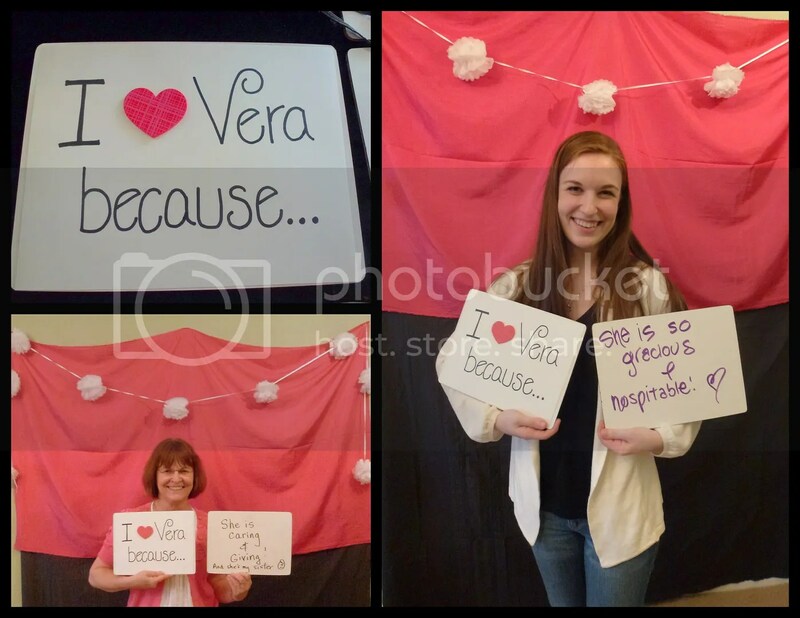 Everyone who came to the party was encouraged to write their response to the I Love Vera because prompt on a white board and take a photo at the photo booth. 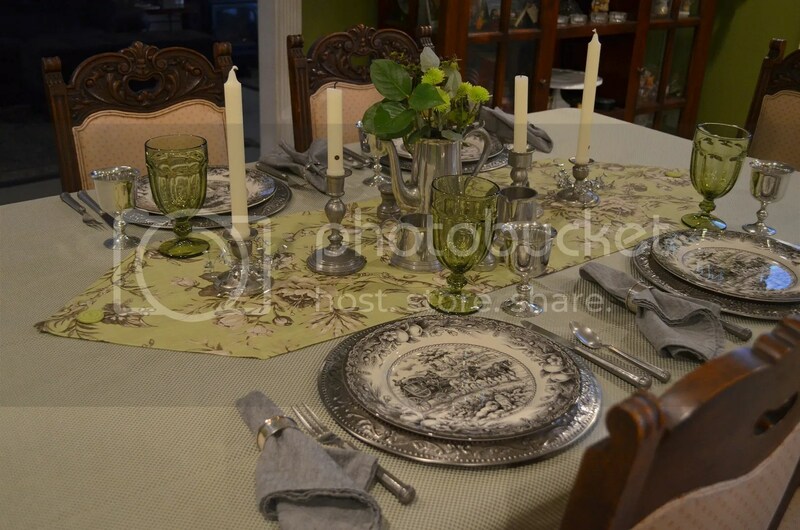 In February of 2013 my cousin and his wife came for a visit and I set a table for a meal together. 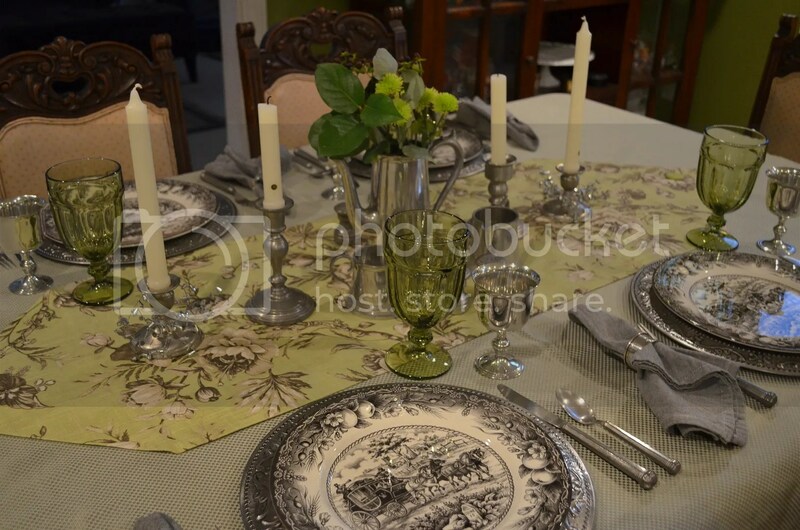 We gathered around the table to enjoy our visitors from California. My cousin and I are Russian and our moms would make Goluptsi for us so I thought it would be a special treat for our evening. Goluptsi are stuffed cabbages. You can see the recipe here. We had a wonderful salad with lots of goodies chopped in it and dressed with our favorite Persian Dressing. 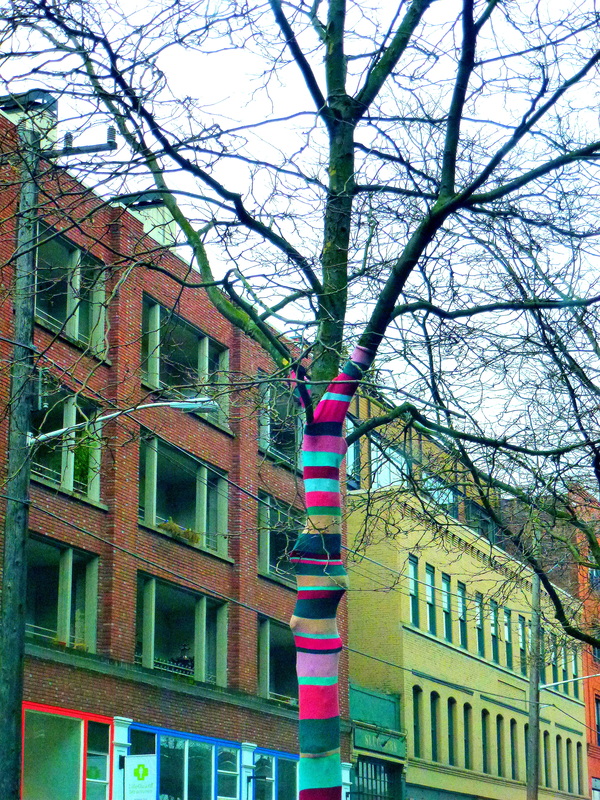 Since I’ve seen that many of you enjoy knitting and working with your hands I thought I’d share some yarn bombing with you. 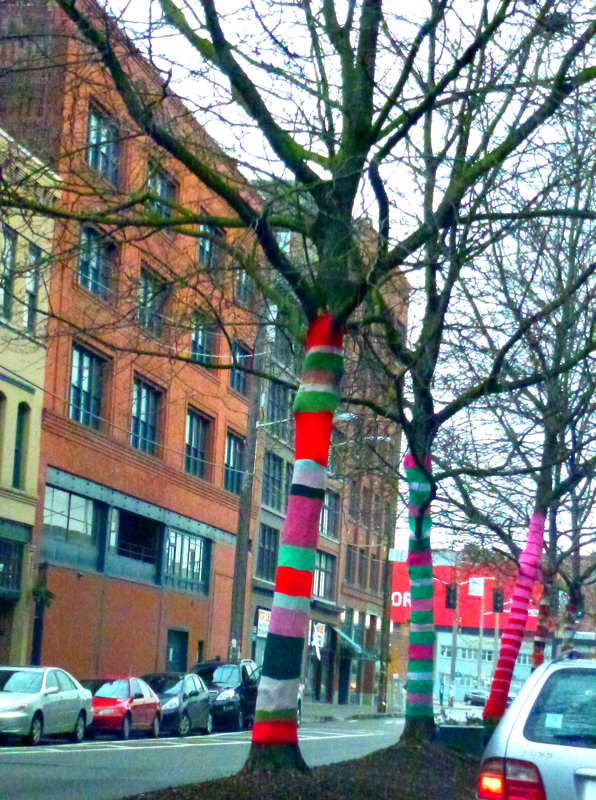 We saw these yarn bombed trees in the Pioneer square area of Seattle in February of 2014. 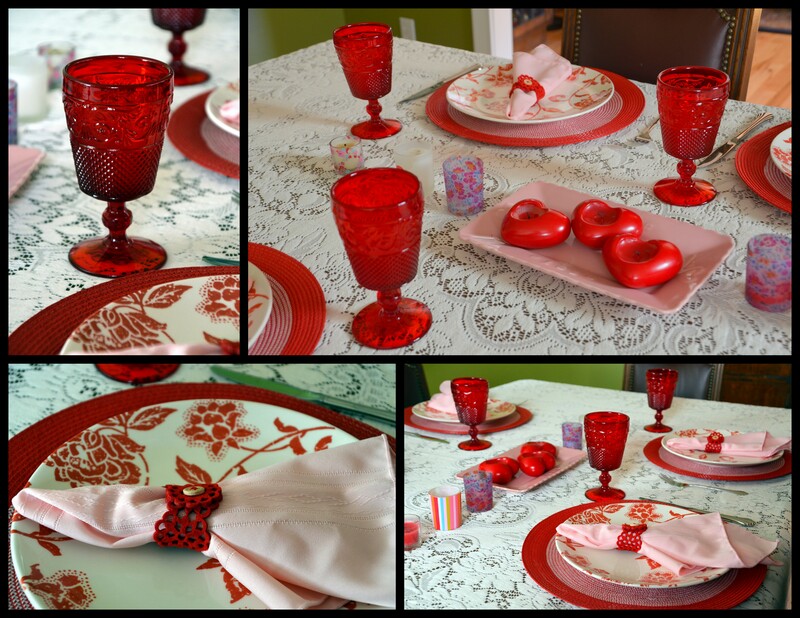 In February of 2015 I set a Valentine’s Day Table for a meal with the family. And last but not least is February of 2016. Our beautiful and fun views on the way home from an early Valentine’s Day lunch on Friday the 12th. 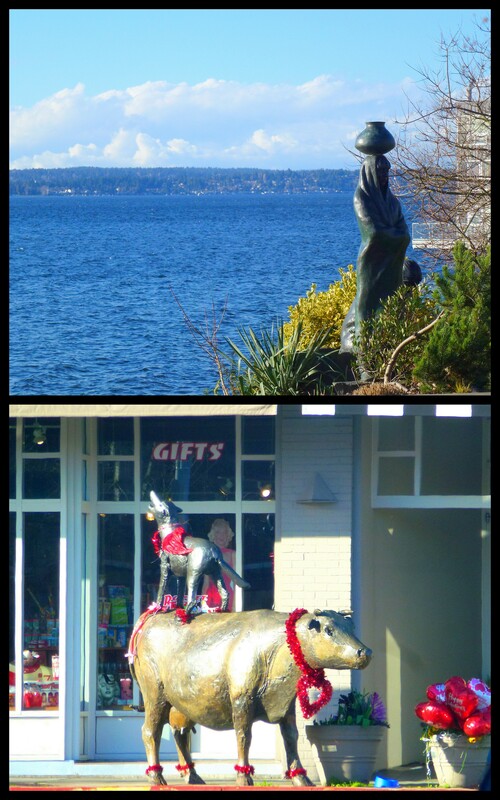 The upper photo is Lake Washington from downtown Kirkland and the bottom is from Kirkland, too. They decorate this cow and dog sculpture according to the times and what is happening. 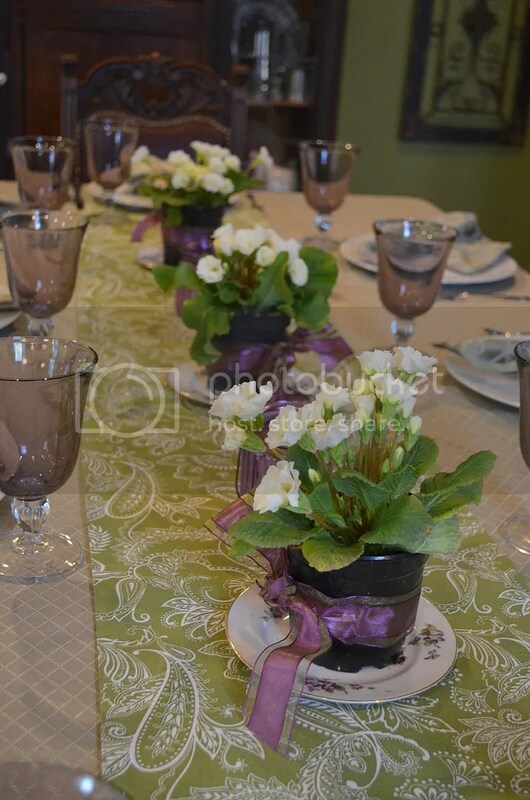 In March they’ll be decorated for St. Patrick’s Day and then for Easter. I’m linking up to Five on Friday with Amy at Love Made My Home and with Friday’s Fave Five with Susanne at Living to Tell the Story. Hope your last weekend in February will be good. We’ve had some glorious sunny days and are now expecting some rain for the weekend. I’ve been able to walk without a rain jacket. Dear has a cold with a nagging cough that we suspect he got on his plane ride to or from Austin. I’m hoping he doesn’t share it with me! 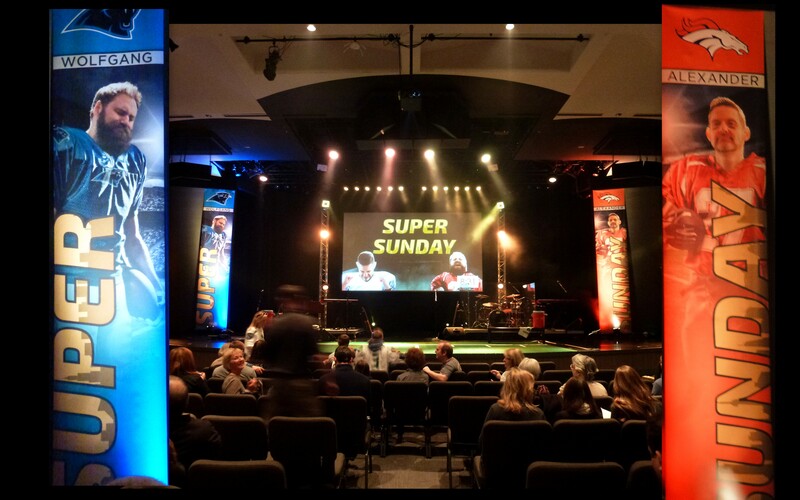 We had a fun celebration on Super Sunday starting with a exhilarating church service. Two of our pastors squared off with a sermon duel with the theme of finishing strong. Quarter one was about Solomon and his varied appetites that kept him from finishing strong. Quarter two was about Moses and his anger that kept him from finishing strong. Quarter three was about Judas and his greed that kept him from finishing strong. Quarter four was about Jesus and although it seemed that He wouldn’t finish strong because of his crucifixion he rose again to victory over death and sin. In order for us to finish strong we need to follow Him. There were penalties thrown and commercials in between quarters, a half time show, and Bibles with football binding given out to kids in the end zone after touchdowns! In the end and maybe a bit prophetic Pastor Alexander with the help of his stand in after his injury on the field (sprained tonsils), pastor Goetze, edged out Pastor Wolfgang for the win. 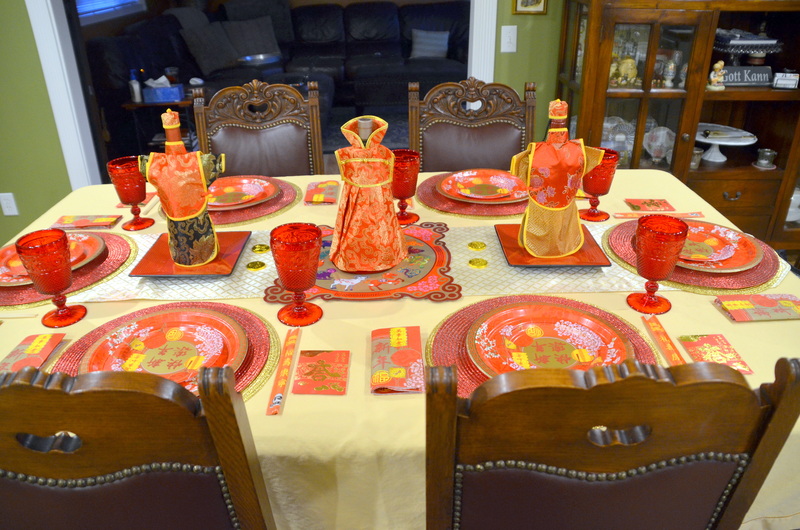 We came home pumped up and started a few preparations for our Super Lunar New Year Bowl party. 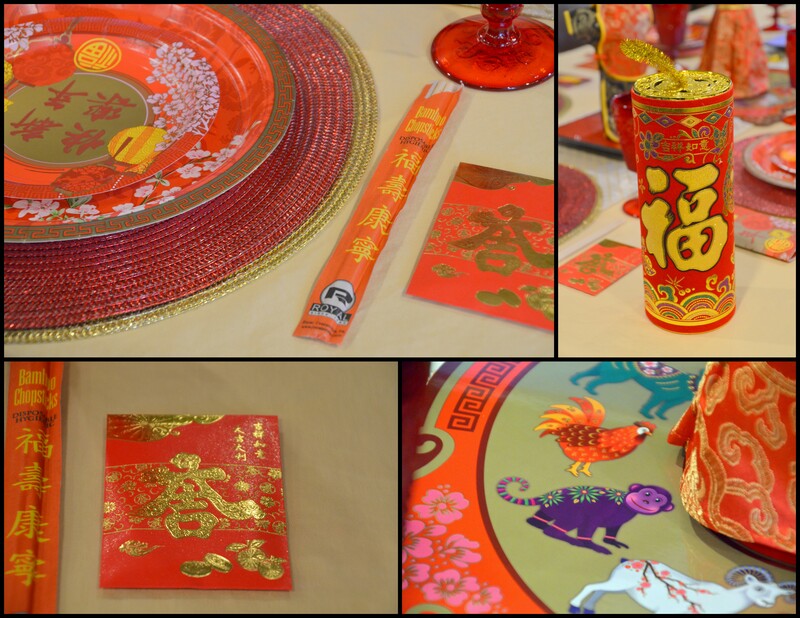 It was fun to gather up goods to set a Chinese New Year themed table for our party. 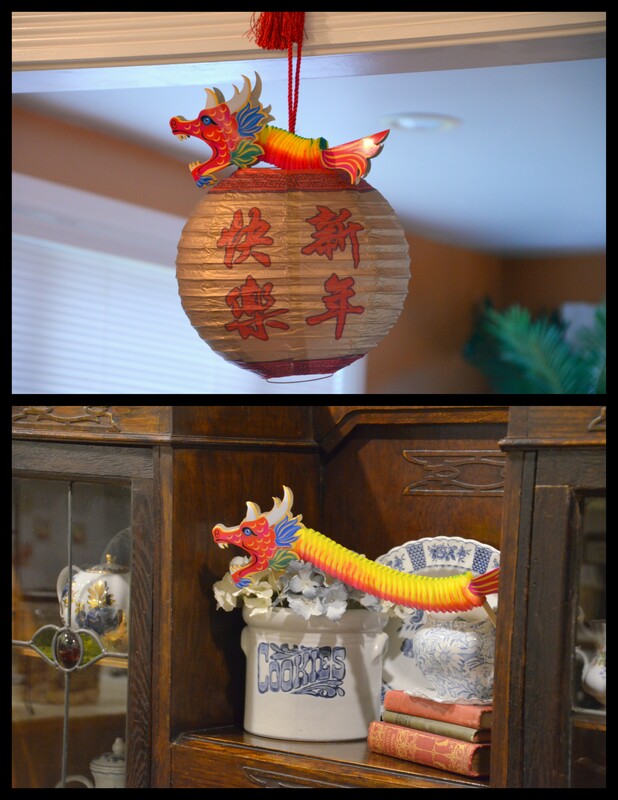 This inspiration started in January while I visited San Francisco’s Chinatown with an old friend of mine. 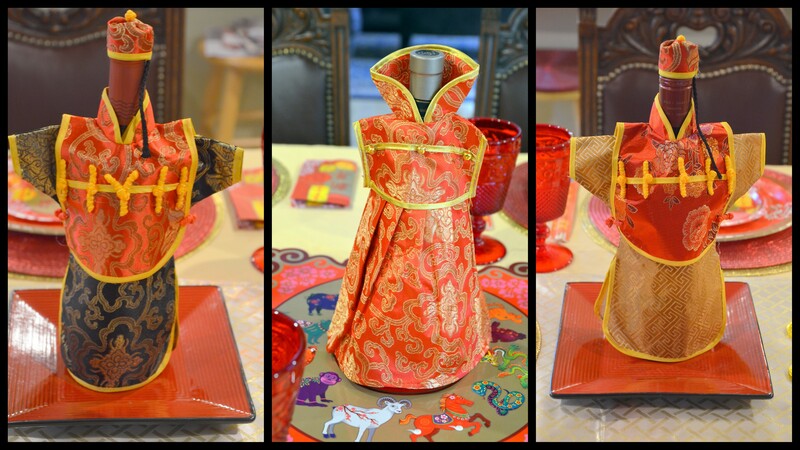 These three wine covers were the instigators for the table. A large variety of these were offered for sale in every shop Alice and I went into on our visit to Chinatown. I kept handling them but walking away. Finally in the last shop we visited my resistance was depleted and I bought these three. Look at those little hats with the braid attached! They were only $1.99 each! 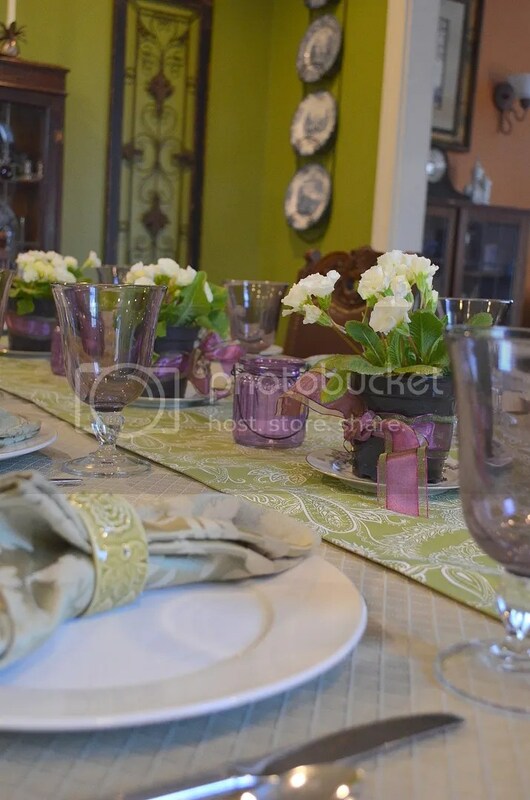 Now I was in search of more items to complete my table and room decor. There are several large Asian stores around our area and I went to one where I found the Lucky pockets, candy, almond cookies and fortune cookies. 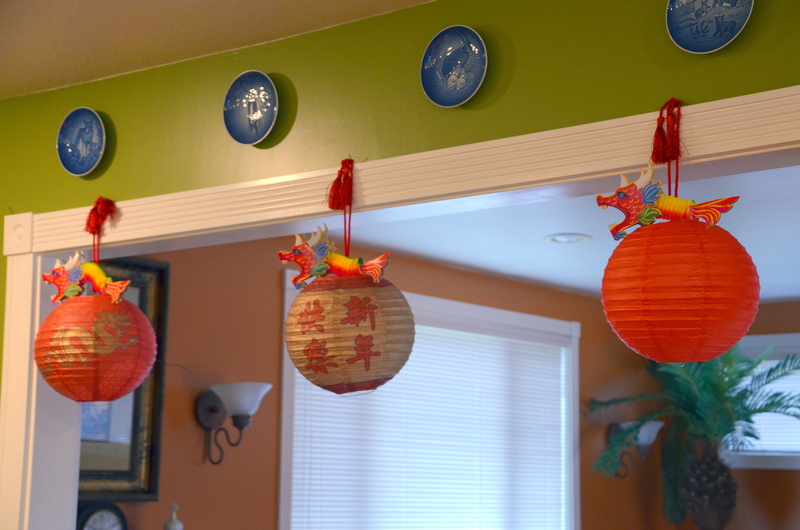 The lanterns, dragons, plates and napkins came from a party store. 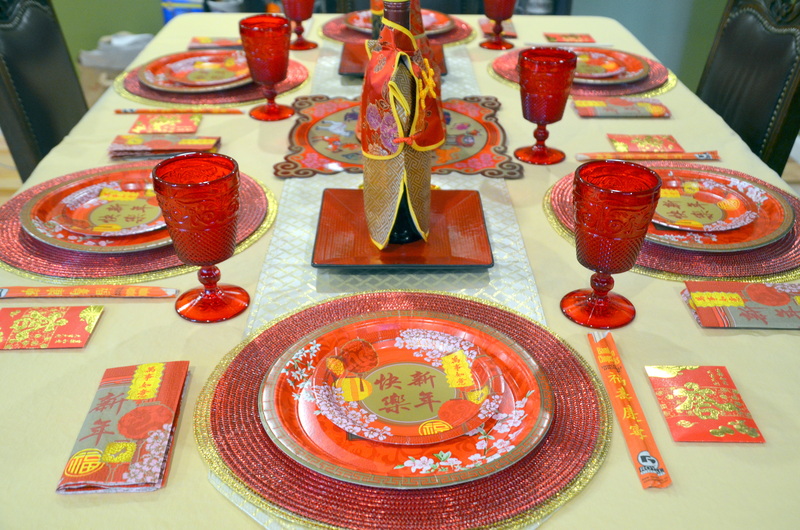 Before hand I queried each of our guests for the party about their favorite Chinese take out dish. 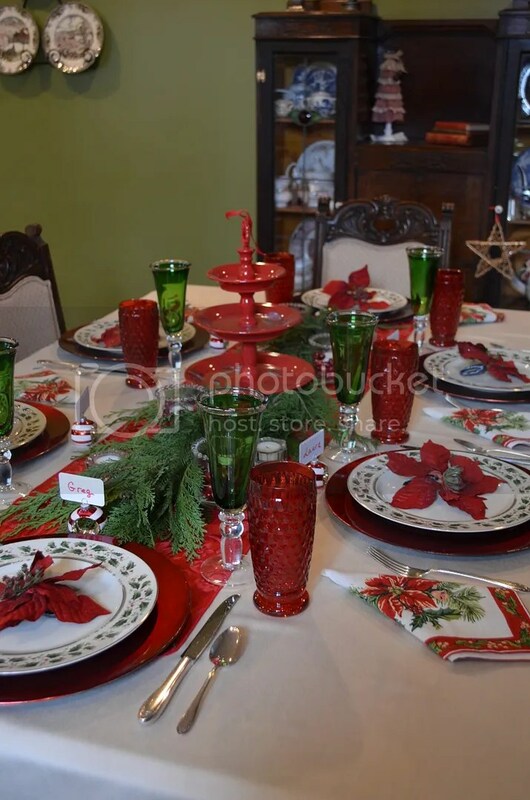 We ordered each of these dishes and picked them up just before our planned start time. This take out idea really made hosting the party easy peasy. We heated up the Panko shrimp from the frozen section at Costco that went real well with sweet chili sauce. We would recommend it if you ever need an appetizer for a party. 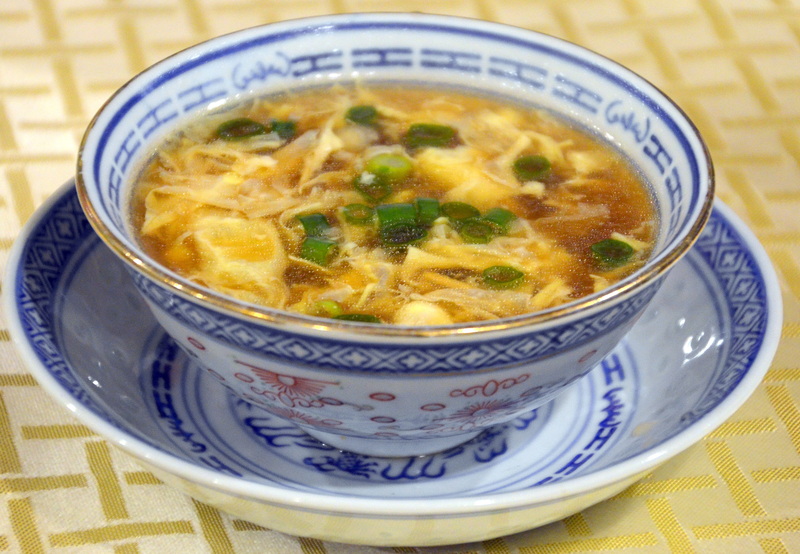 The one thing I prepared from scratch for our party was this Egg Flower Soup. You can click over to Mennonite Girls Can Cook to get the easy recipe today! 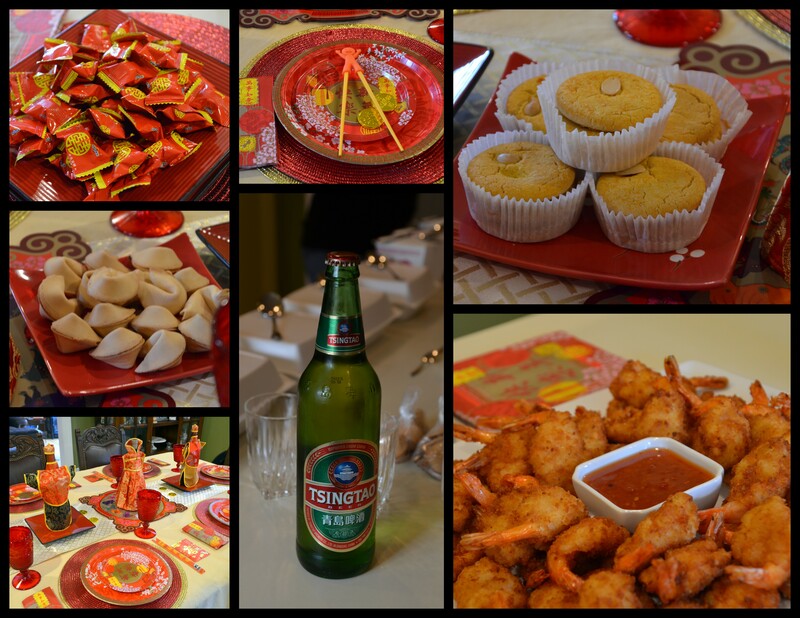 Happy New Year to all our Asian friends who are celebrating today! 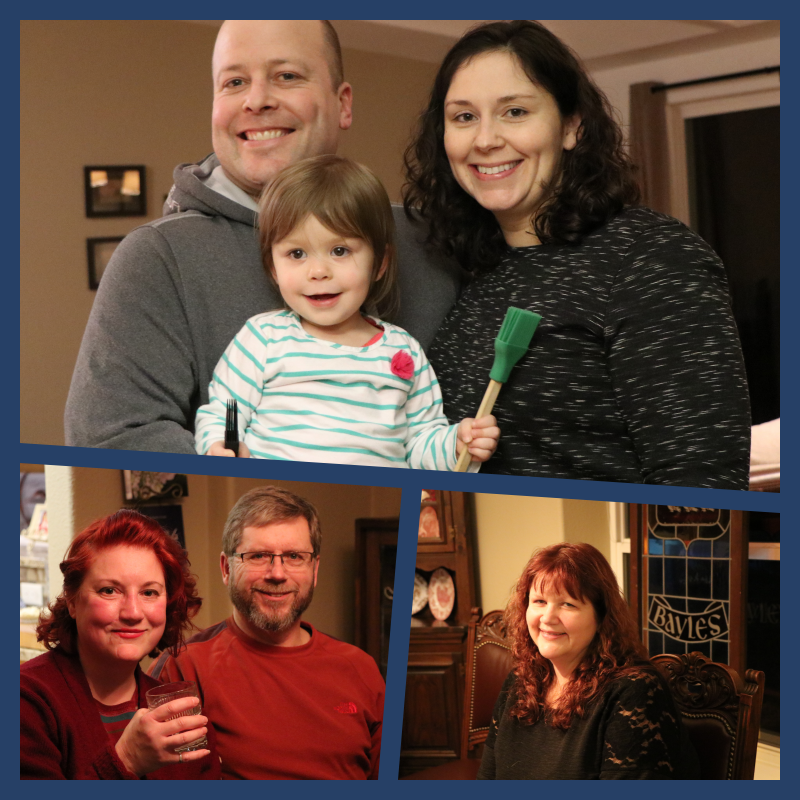 On Monday night we gathered around the table to enjoy our visitors from California. We had stuffed cabbage that we call Goluptsi. You can see the recipe here. 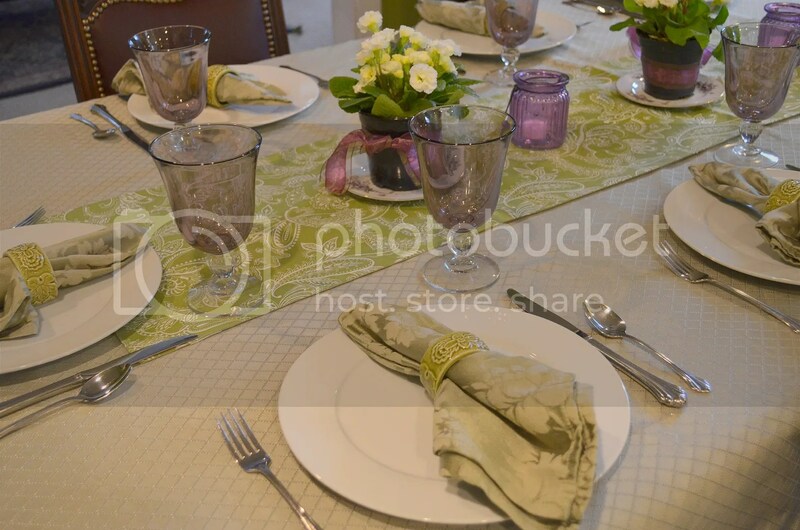 We had a wonderful salad with lots of goodies chopped in it and dressed with our favorite Persian Dressing. Thursday the MGCC girls are being interviewed by Suzanne Woods Fisher at 2:00 PST and 5:00 EST on her Amish Wisdom show. You can listen in on a live feed here. 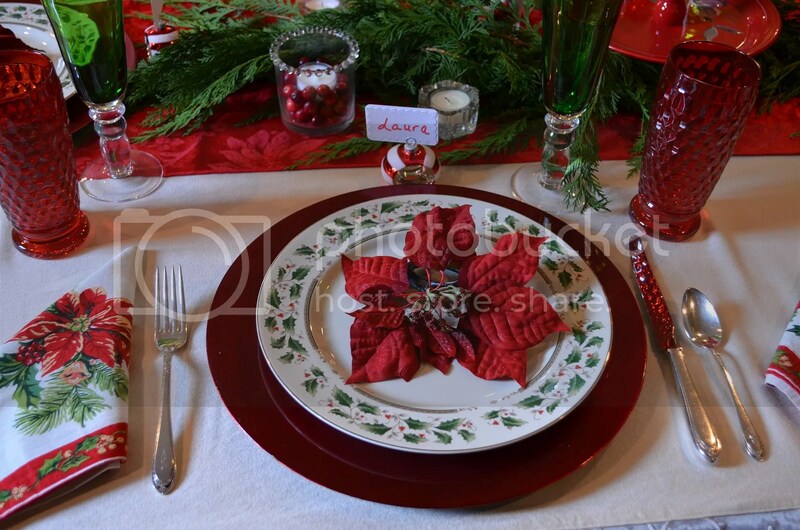 I’m linking up with Kathleen at Cuisine Kathleen for her weekly Let’s Dish Linky Party! 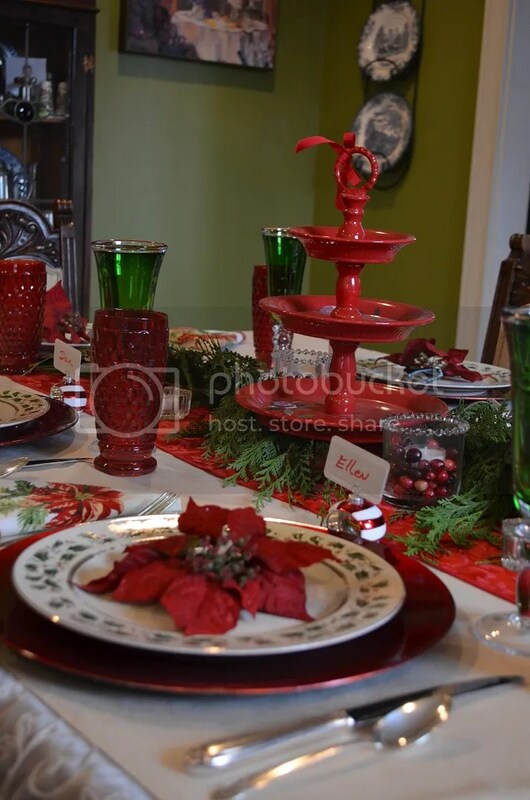 …to my Christmas table decor. 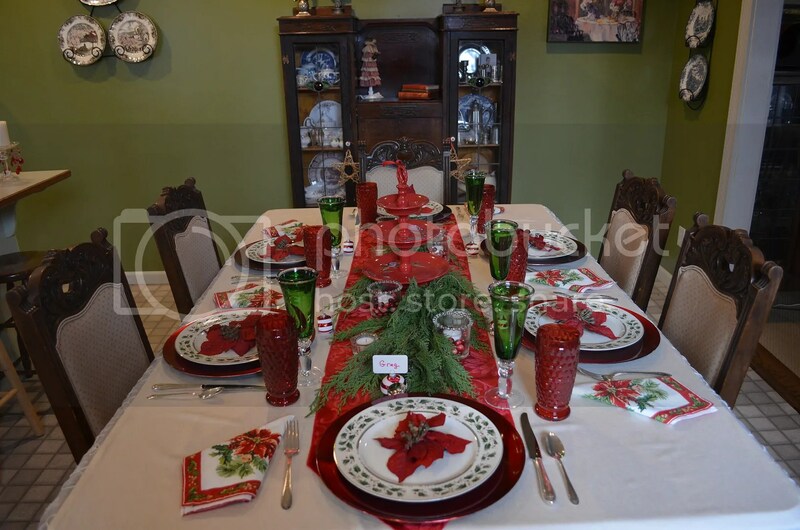 While working on my recipes for our Celebrations Cook book being published at the end of April in 2013 I had to redo one of my recipes which meant I needed to change out my Christmas table. 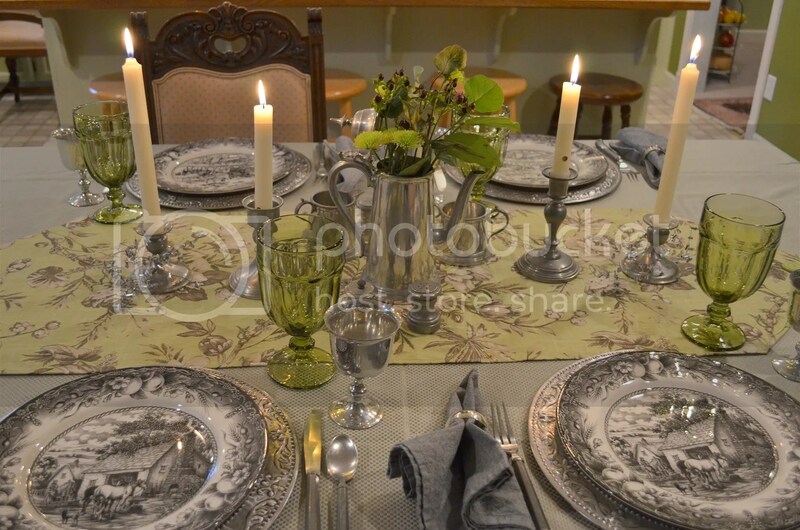 I chose to set the table using my pewter pieces since my entree was a traditional English recipe. 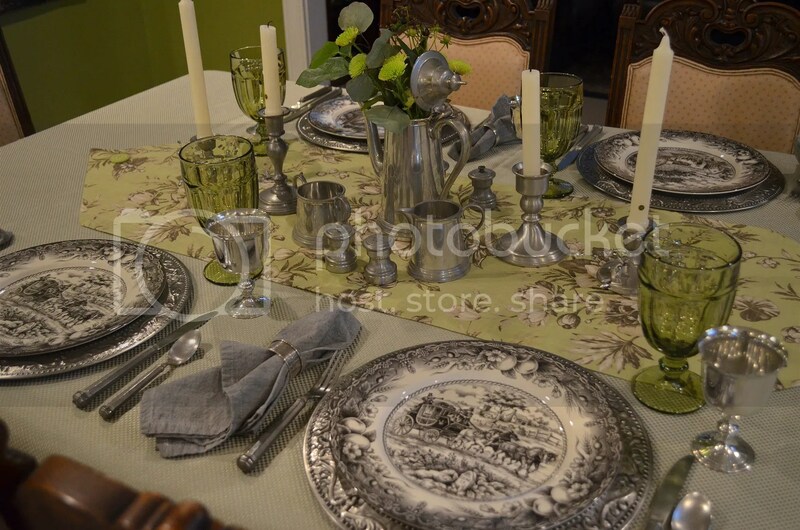 Some of my pewter pieces were acquired in England in the 70’s. 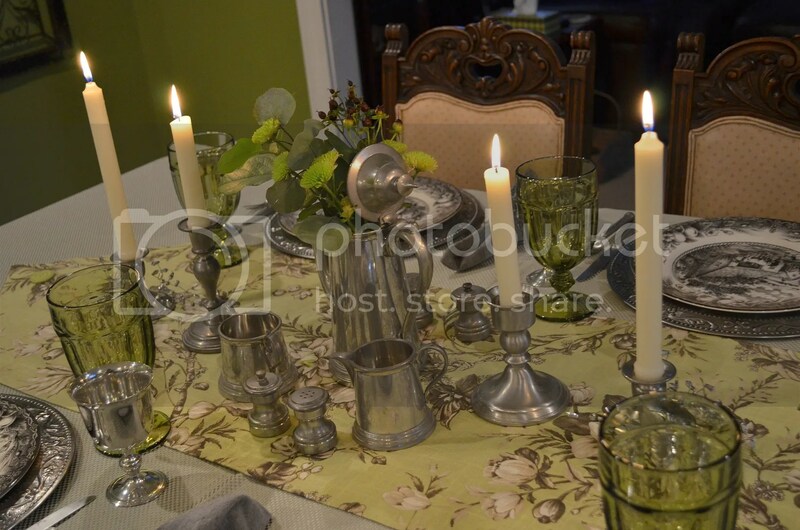 The pewter wine goblets and the Coffee service with creamer and sugar containers along with the salt and pepper shakers are from England. 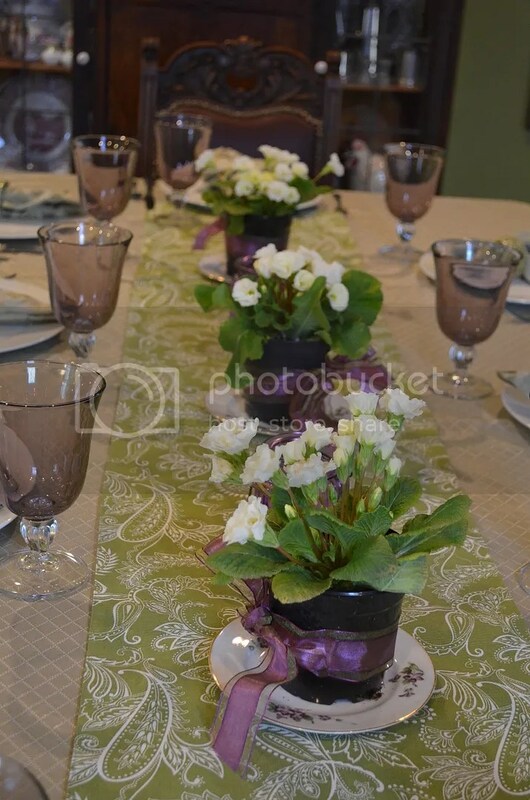 I decided to use the coffee pot as a vase on this occasion. 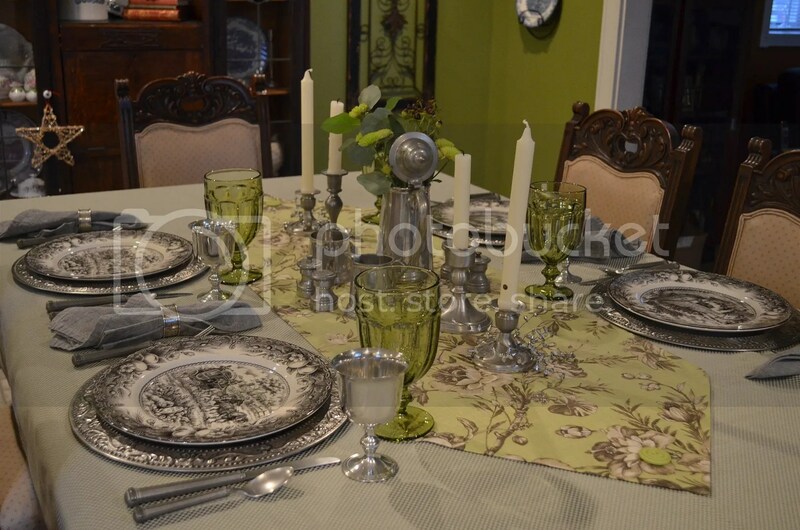 The candle holders are Revere ware and the flatware is Gorham pewter. The chargers were gifted to us from our son and DIL for Christmas one year. 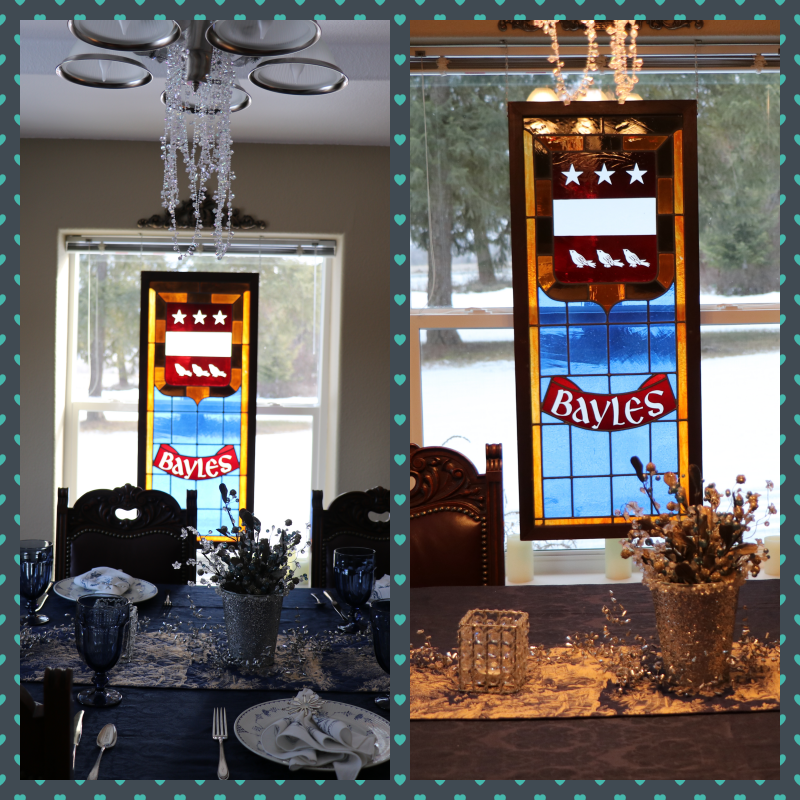 The runner is a gift from our son and DIL, too. 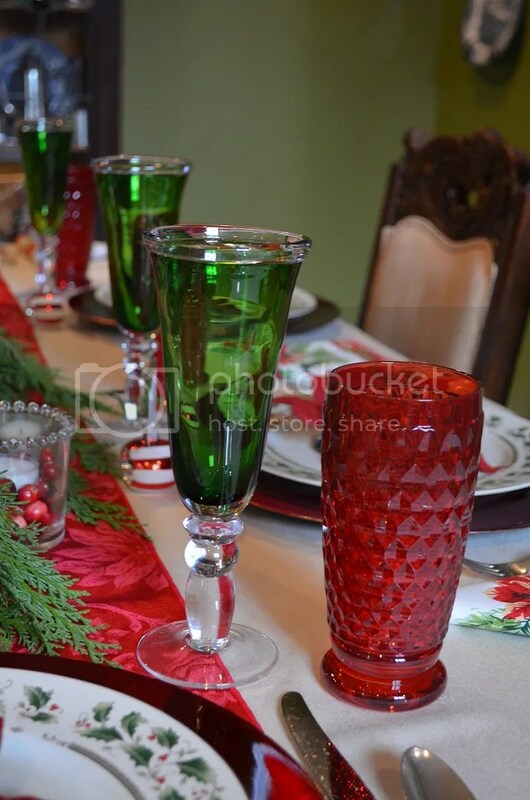 I liked adding in the green goblets with the pewter. 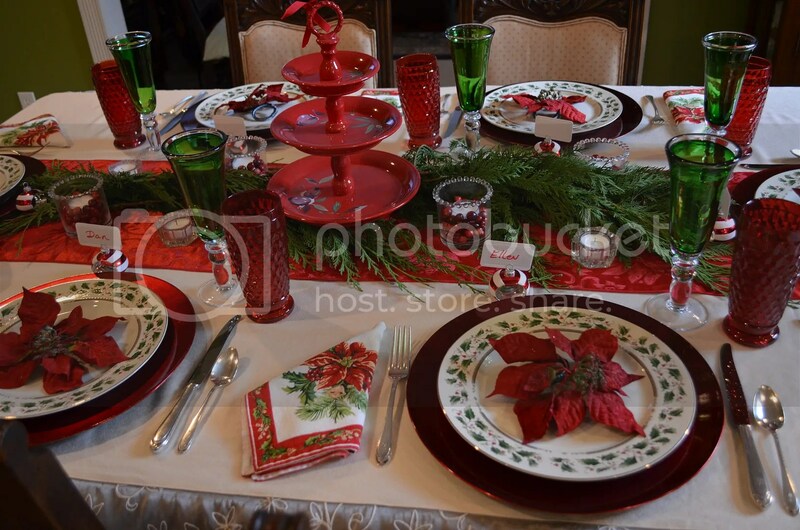 The dishes are Royal Stafford and I think I purchased them at Marshalls. 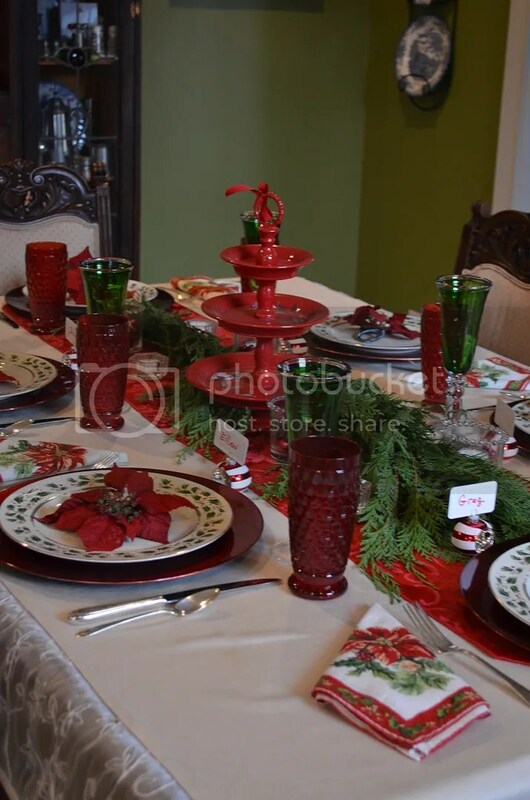 I enjoy this table but soon it will be reset to our casual Christmas setting. Now I need to get busy getting our Christmas cards ready to send out. 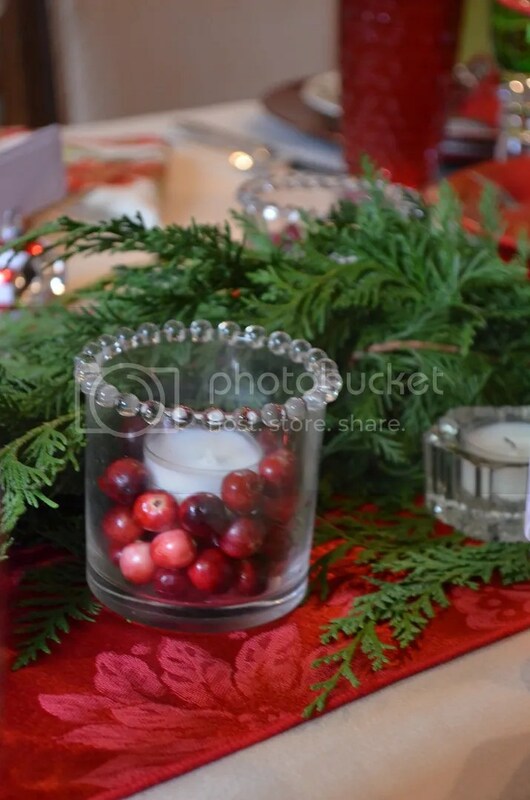 Do you send out Christmas cards and do you add a personal note or do you type one Christmas letter to be included in all your cards? We received good news yesterday from North Carolina! Our son-in-law is now a Marine Corporal. We are so proud of his achievement. I’m hoping to get an updated photo of him with his new blood stripes and pins along with his sword soon. Congratulations Marine Corporal Andrew! 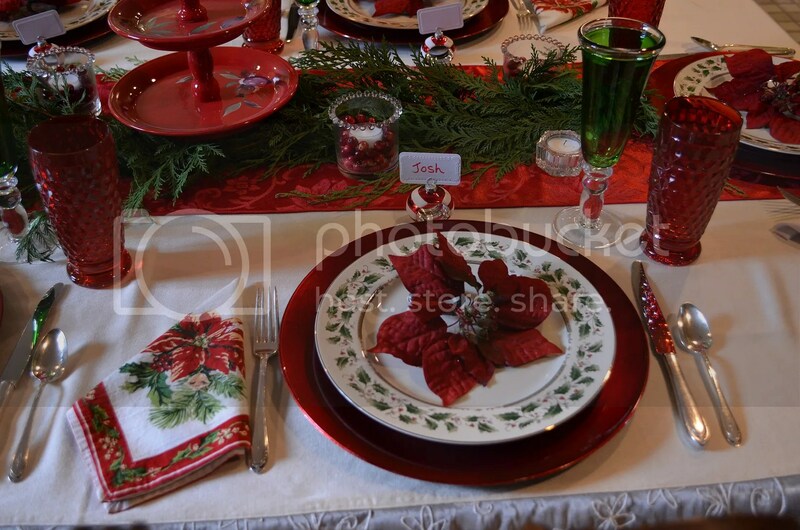 I’m joining Kathleen at Cuisine Kathleen with my first Christmas table for Let’s Dish. 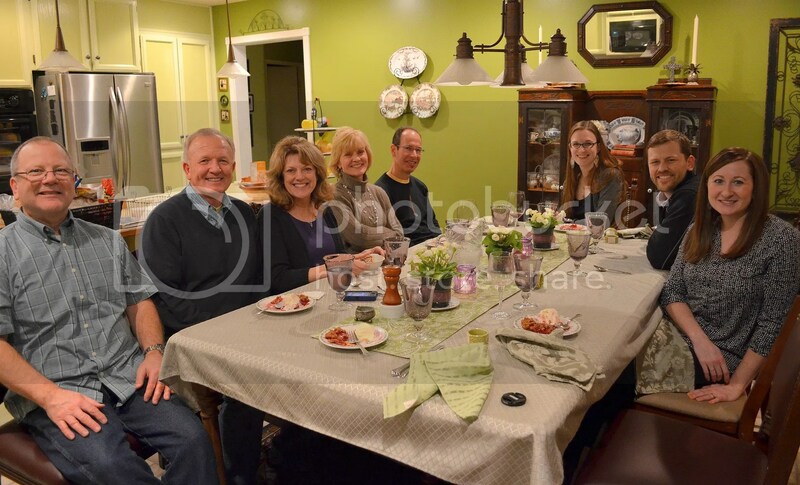 We even had a full on Christmas dinner at this table the Saturday after Thanksgiving with Josh, Laura and Dan. It’s a long story. 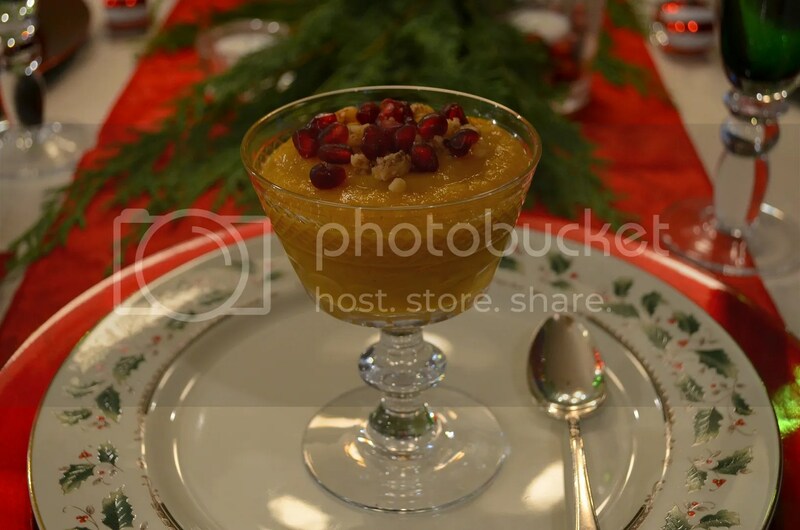 The recipe for this Apple Butternut soup will be shared in December on the Mennonite Girls Can Cook blog. 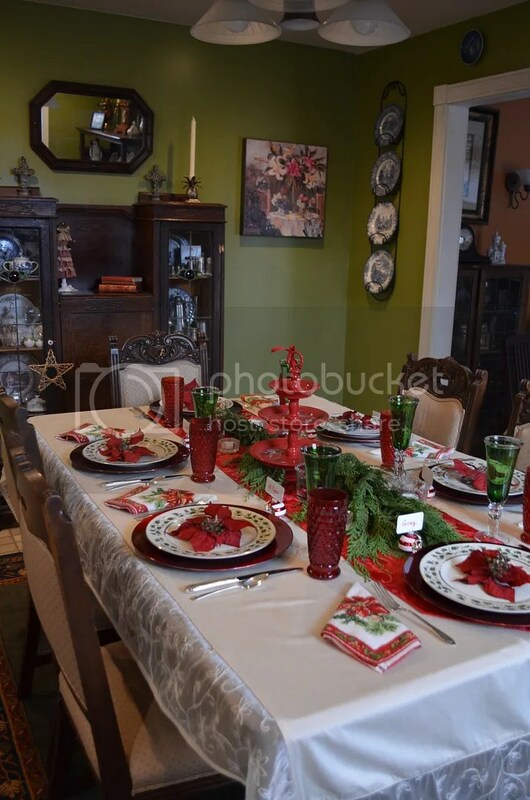 Today I reset the table to my more casual everyday Christmas theme. I hope to share that next week. Friday was our last day of Bible Study till Fall and table leaders were asked to decorate their tables in a Summer Theme. 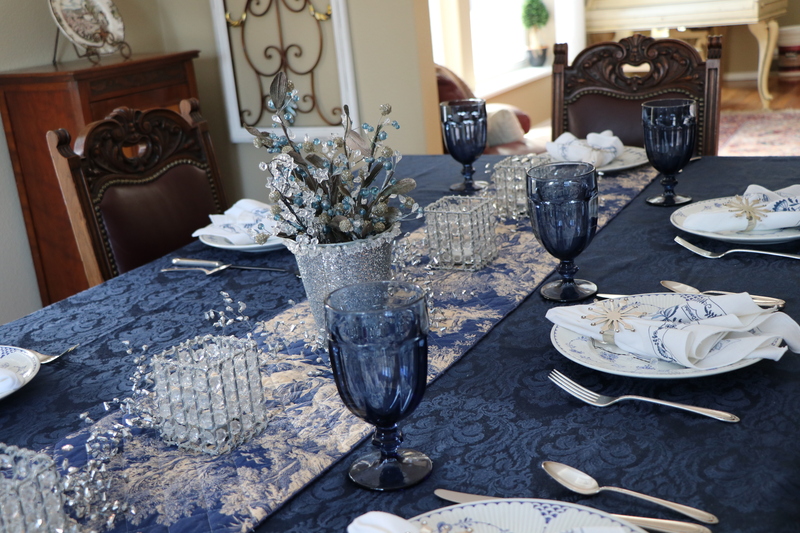 Since there is a lot of blue in my table I decided to share it for Blue Monday. To see more Blue Monday posts visit Smiling Sally who’s busy packing up her house for her move!! 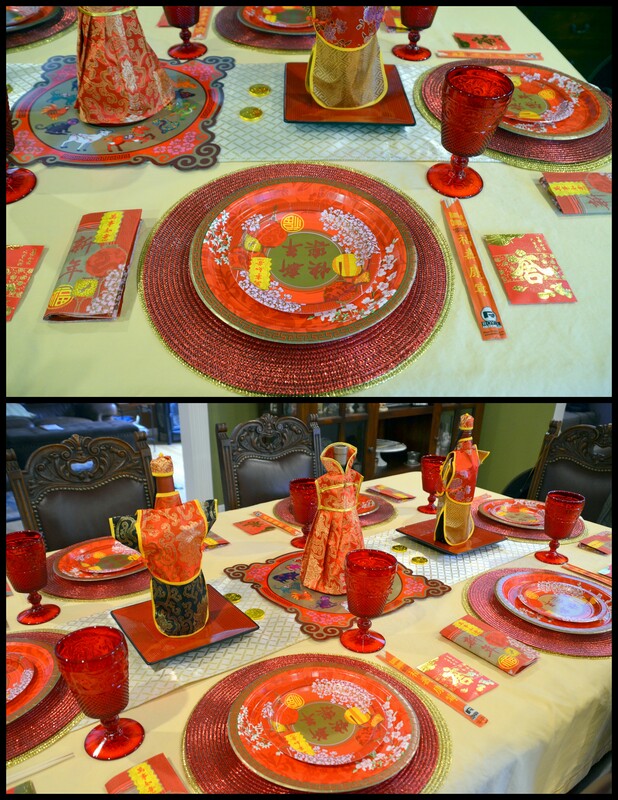 Here’s a collage of some of the other summer tables from Friday. Wow can you believe this Monday is June 1st!! Happy Blue and Happy June everyone! 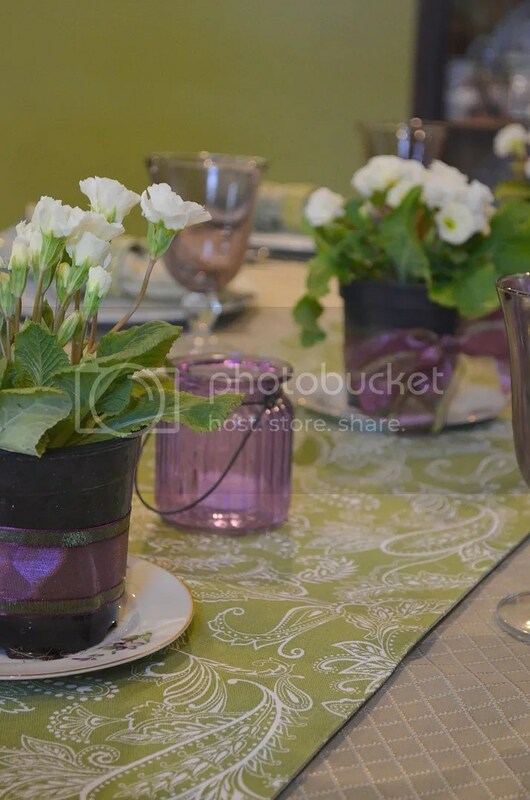 Photobucket is holding all my photos that I stored on their site from 2007-2015 hostage replacing them with ugly grey and black boxes and asking for a large ransom to retrieve them. It is a slow process to go through all my posts deleting the ugly boxes.